This chili is healthy, comforting, filling and SO easy to throw together. It’s simple and calls for ingredients you probably have in your pantry and fridge. This chili is loaded with vegetables, beans and tomatoes and the right amount of spices to make it taste amazing. It makes a nice large batch which makes it perfect for pot lucks and parties. It is on the mild side (that’s how we roll here with three little kids), so feel free to add another jalapeño or leave the seeds inside to make a spicier chili. 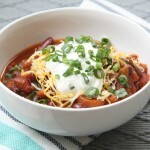 You can leave the chili as is or add your favorite toppings such as sour cream, cheese, onions or avocados to the top. Enjoy! Heat olive oil in a medium to large skillet then add the onions, carrots and celery for four minutes or until the vegetables start to soften. Add the bell pepper and sauté for another 2 minutes. Finally, add the garlic and sauté an additional minute. Add the vegetables and all remaining ingredients to the slow cooker and stir to combine. Cover and cook on low for six hours. Eat chili plain or add your favorite toppings such as: cheese, sour cream, onions, avocado or tomatoes. A Kitchen Hoor’s Adventure and Tidy Mom.